Mouse monoclonal COX IV antibody [mAbcam33985]. Validated in WB, IHC, Flow Cyt, ICC/IF and tested in Mouse, Rat, Sheep, Cow, Human, Xenopus laevis, Monkey, African green monkey and more. Synthetic peptide (the amino acid sequence is considered to be commercially sensitive) within Human COX IV aa 150 to the C-terminus (C terminal) conjugated to Keyhole Limpet Haemocyanin (KLH). The exact sequence is proprietary. WB: Jurkat and HepG2 whole cell lysates and human skeletal muscle, mouse skeletal muscle and cow kidney tissue lysates. Our Abpromise guarantee covers the use of ab33985 in the following tested applications. Ab33985 staining COX IV in HeLa (Human cervix adenocarcinoma epithelial cell) cells by ICC/IF (Immunocytochemistry/Immunofluorescence). Cells were fixed with 4% paraformaldehyde and permeabilized with 0.1% TritonX-100. Samples were incubated with primary antibody at 1:1000 dilution (1µg/ml). An Alexa Fluor®594 Goat anti-mouse (ab150120) was used as a secondary antibody at 1:1000 dilution (2 µg/ml). Cells were counterstained with anti-Cyclophilin F (ab231155, 5.5µg/ml) and AlexaFluor®488 Goat anti-Rabbit (ab150077, 2µg/ml). DAPI was used as a nuclear counterstain. Ab33985 was used for negative control 1 at 1:1000 dilution (1µg/ml). For negative control 2, ab231155 was used at a 1:100 dilution (5.5µg/ml) and ab150129 was used as a secondary antibody at 1:1000 dilution (2µg/ml). Confocal image showing mitochondrial staining in HeLa cell line. ICC/IF image of ab33985 stained human HeLa cells. The cells were PFA fixed (10 min), permabilised in TBS-T (20 min) and incubated with the antibody (ab33985, 1µg/ml) for 1h at room temperature. 1%BSA / 10% normal serum / 0.3M glycine was used to quench autofluorescence and block non-specific protein-protein interactions. The secondary antibody (green) was Alexa Fluor® 488 goat anti-mouse IgG (H+L) used at a 1/1000 dilution for 1h. Alexa Fluor® 594 WGA was used to label plasma membranes (red). DAPI was used to stain the cell nuclei (blue). Overlay histogram showing HeLa cells stained with ab33985 (red line). The cells were fixed with 80% methanol (5 min) and then permeabilized with 0.1% PBS-Tween for 20 min. The cells were then incubated in 1x PBS / 10% normal goat serum / 0.3M glycine to block non-specific protein-protein interactions followed by the antibody (ab33985, 1µg/1x106 cells) for 30 min at 22ºC. The secondary antibody used was DyLight® 488 goat anti-mouse IgG (H+L) (ab96879) at 1/500 dilution for 30 min at 22ºC. Isotype control antibody (black line) was mouse IgG1 [ICIGG1] (ab91353, 2µg/1x106 cells) used under the same conditions. Acquisition of >5,000 events was performed. 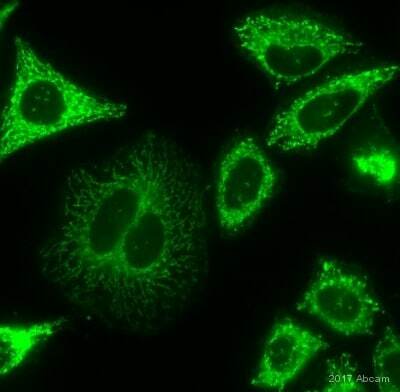 ab33985 staining COX IV in human proximal tubular epithelial cells by ICC/IF (Immunocytochemistry/immunofluorescence). Cells were fixed with paraformaldehyde, permeabilized with 0.5% Triton X-100 in PBS and blocked with 3% BSA for 15 minutes at 20°C. Samples were incubated with primary antibody (1/200 in PBS) for 45 minutes at 20°C. ab6785, a FITC-conjugated goat anti-mouse IgG (H+L) polyclonal was used as the secondary antibody (1/1000). ab33985 staining COX IV in mouse kidney (tubules) tissue sections by Immunohistochemistry (IHC-P - paraformaldehyde-fixed, paraffin-embedded sections). Tissue was fixed with formaldehyde, permeabilized with 0.2% trition X-100 and blocked with 5% serum for 1 hour at 25°C; antigen retrieval was by heat mediation in sodium citrate buffer pH 6. Samples were incubated with primary antibody (1/200 in PBS) for 9 hours at 4°C. 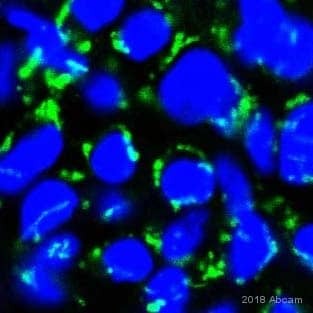 An Alexa Fluor® 594-conjugated goat anti-mouse IgG polyclonal (1/500) was used as the secondary antibody. DAPI was used for staining the nucleus. Blocking peptides at 1.5 % per lane. Publishing research using ab33985? Please let us know so that we can cite the reference in this datasheet.